[vc_row row_type=”row” type=”full_width” text_align=”left” background_image_as_pattern=”without_pattern” padding_top=”50″ padding_bottom=”50″][vc_column width=”1/2″][vc_column_text]The Erasmus+ program has started expanding from Europe to many other regions of the world – among others to Israel. 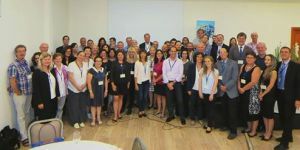 Approximately 50 Austrian and Israeli higher education institutions from all academic disciplines have recently gathered near Tel Aviv to discuss joint activities. Under the aegis of the EU and Austrian Embassies to Israel, the event was co-organized by the national Erasmus+ offices of both countries. 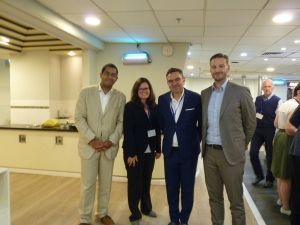 IBA Director of Studies Prof. Julius Dem, Dr. Elisabeth Kübler from the LBS International Relations Department and Tel Aviv-based IBA alumnus Razi Golan contributed to the two-day seminar. 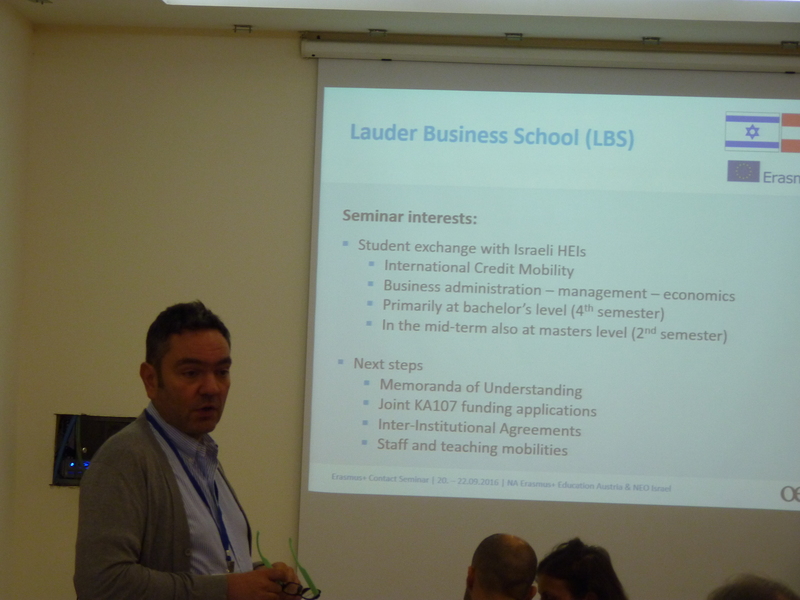 LBS is particularly interested in establishing student credit mobility schemes with selected Israeli business schools. 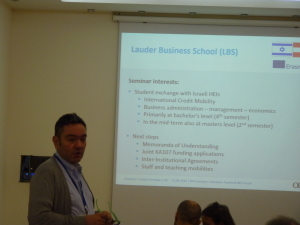 In the medium term this would enable outstanding LBS students at bachelor’s and master’s level to spend an exchange semester at one of LBS’s Israeli partner universities; vice-versa Israeli students would study at LBS for one semester. As an accompanying measure, also faculty and staff members from either side should be granted the opportunity of short-term stints at LBS and in Israel, respectively. The present journey to Israel included on-campus visits to the Ben-Gurion University of the Negev in Beer Sheva (BGU) and the Interdisciplinary Center Herzliya (IDC). LBS and BGU have already concluded a Memorandum of Understanding, and are working on inter-institutional agreements and funding applications for the above-mentioned mobilities. The joint activities will be implemented with the Guilford Glazer Faculty of Business & Management and the Centre for the Study of European Politics and Society. 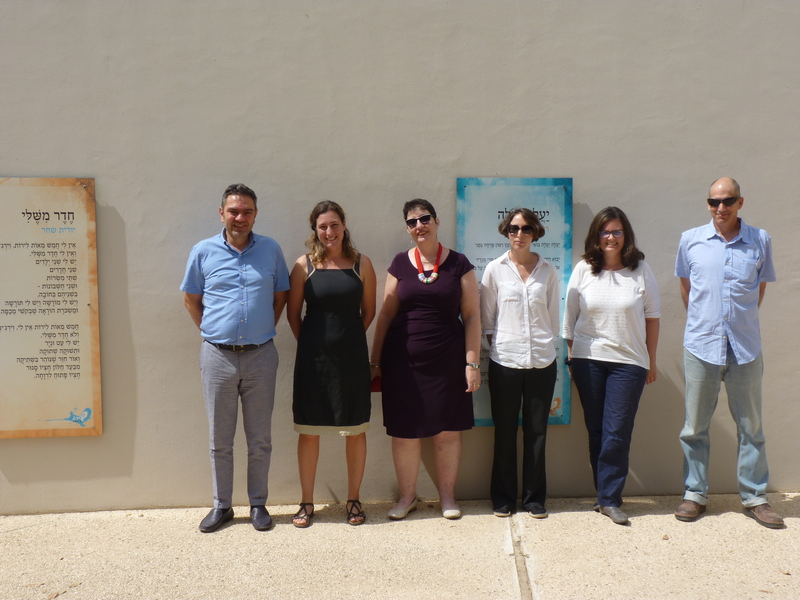 Further cooperation steps with the IDC Herzliya are currently under review. 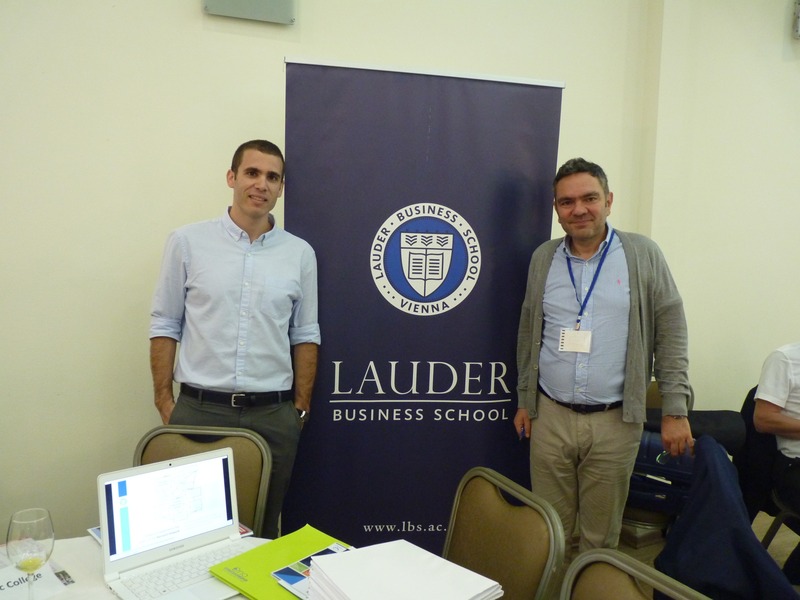 At the Erasmus+ contact seminar, LBS attracted particular attention thanks to its international academic orientation (e.g. 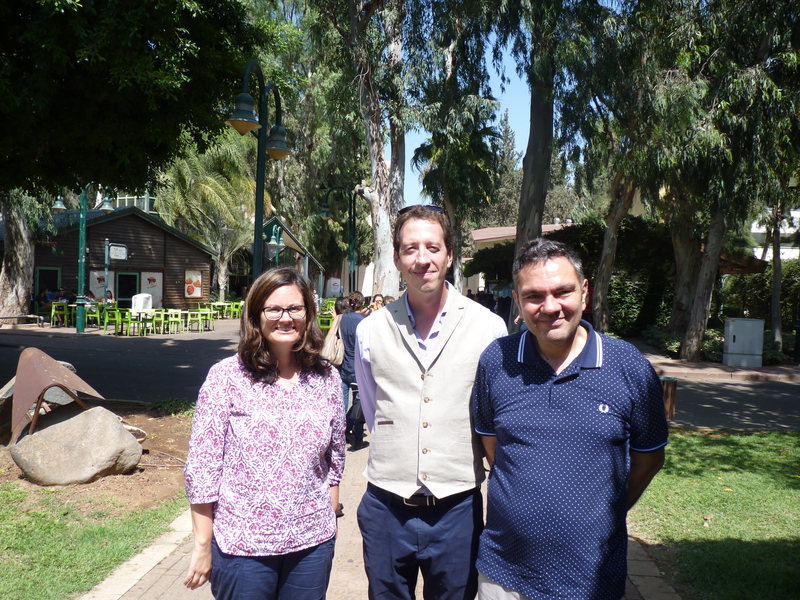 English-language degree programs), and its founding mission of developing a lively many-sided Jewish community on campus (i.e. 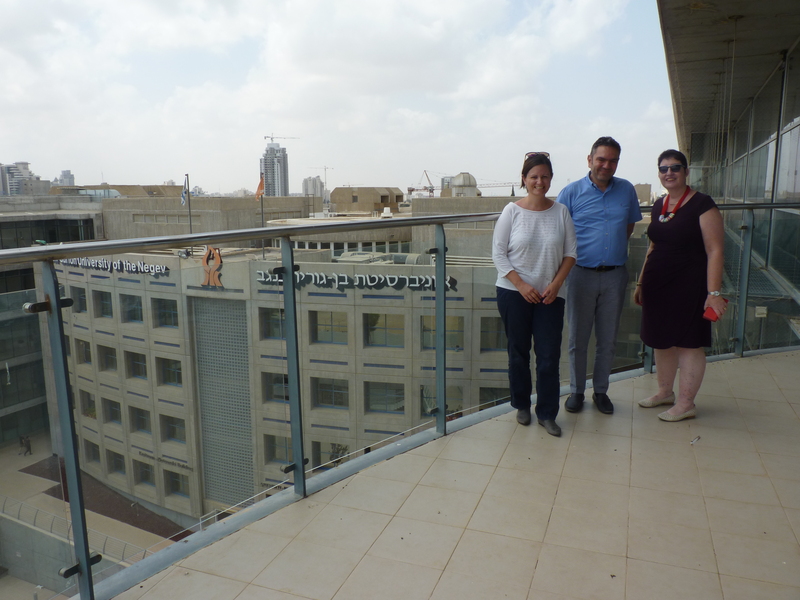 dormitories, kosher canteen, and observance of Jewish holidays). 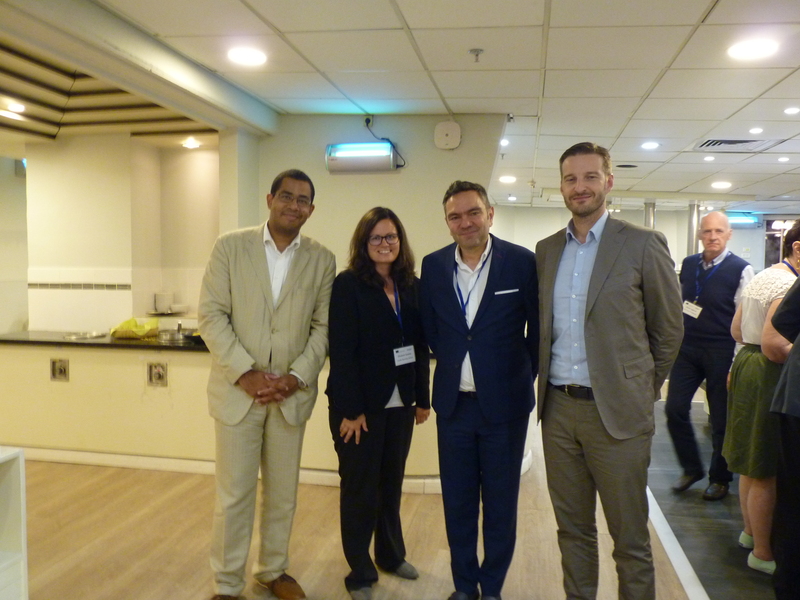 Faculties of economics and management at Israeli research universities and likewise colleges with a business focus expressed their interest in strengthening ties with LBS.